I had been searching for this Drake mouthpiece for years in the tip opening that I prefer when one fateful day a Facebook post lead to a purchase and a fantastic revelation. Did I need an new mouthpiece? Of course not, I was quite happy with the Jody Jazz DV I’d been playing for the year prior. But when that piece came along I just new I had to jump on it. Yes, GAS (Gear Acquisition Syndrome) still effects me, though I do still play the same Yamaha horn I have for over a decade now. My first impression when it arrived was of how beautiful the baffle was finished. The transition from the tip rail through the baffle and into the chamber were smooth and even. The transition from the chamber into the back bore and shank was gently rounded and is a wonder to behold. The mouthpiece offers almost no resistance to airflow due to its smoothed and streamlined interior. It is clear from even the most cursory examination of the mouthpiece internals that a craftsman has spent a lot of time on the piece. From the exterior the piece has Drake’s signature and logo cast deeply into the mouthpiece barrel and a brass ring to decorate and strengthen the shank. The beak is a slim scoop-bill beak that I feel a doubler could jump into rather quickly. And especially quick if the doubler already plays a Drake piece. The beak has a tenor type mouth-feel which is very comfortable. Tone: As for the design intentions of Mr. Drake I’ll have to let him speak for himself. I use this piece in big band, jazz combo, and Ska band. This piece does all of these things well. Also, the design looks original and distinctly different from anything else. So many manufacturers are busy trying to replicate the sound or feeling of vintage pieces that unique and novel takes on sound are ignored or buried. The tone is a bit thinner and buzzier than I prefer with the synthetic reeds i usually prefer. The warmth returns in force when a quality cane reed is used. This is a slight negative as I prefer synthetics so I see a little more experimenting with synthetics in my future. Featuring an innovative chamber design, these mouthpieces will give the projection and “punch” that you are looking for. The medium reverse taper / venturi chamber is ideal for massive projection, while still maintaining a depth and balance in the overtone series. 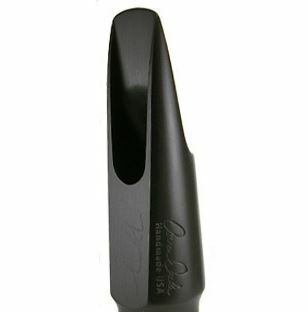 Each of the mouthpieces features the same chamber design with variation in the baffle angle and floor slope to meet the exact tonal preference of the player and the type of Bari they are using. Value: This is where i am flummoxed. Such a fantastic hand finished mouthpiece is being sold at great prices and they are hardly mentioned at all. Plenty of pros play these pieces and occasionally they end up in the used marketplace but I feel they are under represented as a whole. This piece is not priced as affordable as a Morgan or RPC but also not as expensive as a Ted Klum, Jody Jazz or Theo Wanne. With that in mind as a mid priced ($251 – $400) mouthpiece it is a great bargain in the mid 200’s used and less than $400 new. Reed friendliness: This piece is somewhat unique in that the facing is quite friendly to reeds. From Legere to Rico Orange box cane reeds, nothing stands in it way. I’ve play #2 Marca’s and Rico’s on it all the way to Vandoren blue box #4 and it played well. The sweet spot for me is in the 2.5 range but I think i will be moving a half up to reduce the higher partials in the sound. TAKE AWAY: Would I buy this again? Absolutely, it’s a handcrafted piece with great depth of tone and flexibility. I recommend trying one if at all possible before buying your next bari piece.